To call the Lenovo ThinkPad X1 an exciting product would be an understatement. The thin, lightweight, premium business ultraportable laptop from one of the oldest brands among PC manufacturers has reached new heights and become a standard bearer of sorts for the rest of the industry. Besides superlatives, one thing is for sure: the ThinkPad X300 / X301 definitely has a worthy successor with the ThinkPad X1 ultraportable. The new ThinkPad X1 continues in the tradition tracing back to its IBM heritage of making greyish looking laptops. Lenovo has made minor changes, cloaking the ThinkPad X1 in soft rubberized exterior with angular, bevelled edges -- it feels nice and smooth. The Lenovo and ThinkPad logos beam proudly on top of the gray slab. The laptop is a ruggerized chunk of sturdiness which is evident once you handle it. Did we forget to mention the Lenovo ThinkPad X1 is a thin, ultraportable business laptop? When propped open, its base is much thinner than the diameter of a Re. 1 coin. The laptop’s screen is also quite thin. In fact, the unit is as thin as 0.65-inches and weighs as little as 1.72-kg. There you have it, the ThinkPad X1 is just as thick as a Re. 1 coin. Not bad, aye? Like the Apple MacBook Air, Lenovo also hasn’t compromised on build quality to reduce the X1’s thickness. As a result, the laptop feels strong and rugged. Love it or hate it, but the fact is that the ThinkPad X1’s simple style and monotonous color-scheme goes well with its intended audience -- a business executive. And the surface coating of the screen lid feels elegant on touch. When propped open, the Lenovo ThinkPad X1 looks like pretty much any other ThinkPad you might have seen in the past -- with the exception of those ThinkPad Edge laptops that had their screen lids painted red. The 13.3-inch (1366x768 resolution) glossy LED-backlit LCD screen has an edge-to-edge corning Gorilla Glass coating -- a norm on most high-end smartphones these days. This makes the Lenovo ThinkPad X1’s screen highly scratch-resistant. A 2.0MP webcam is grooved into the top bezel for HD 720p video calls. Lenovo has made some design changes with the X1’s keyboard -- key design, specifically -- which we will cover in the next slide. The Lenovo ThinkPad X1 adopts the isolated key design previously seen on the ThinkPad Edge laptops. They keys aren’t raised anymore, but segregated with a slight dip in them -- scalloped like a spoon scoop. This helps finer finger placement on the key and improves ergonomics. The keyboard deck is strong, doesn’t dip and there is no flex whatsoever while typing -- it’s one of the best laptop keyboards you will ever encounter. The X1’s palmrest is nice and wide with a fingerprint scanner placed on the right. A closer look at the ThinkPad X1’s trackpoint, a mode of screen cursor/pointer input that ThinkPad users swear by. The individual chiselled key design and placement is also noticeable in greater detail. The keyboard is definitely different from the flat-top, chiclet layout of the MacBook Air. What’s more, it is spill-resistant, capable of handling up to 60 ml of fluid without any damage to the system’s innards -- courtesy a clever plumbing beneath that isolates spilled liquid from sensitive electronics and dumps it out through channels. The trackpad has a finely textured grid for traditional navigation of mouse on screen. The Lenovo ThinkPad X1 drops dedicated mouse buttons present on previous X-series ThinkPads -- right now the trackpad is a single mass with a designated area for mouse ‘clicks’. The three buttons at top work in tandem with the red trackpoint we saw in the previous image. The ThinkPad X1’s power switch sits to the right of the keyboard, near the top. The blue button launches proprietary tools (more on that later), while the other three are audio controls. They come in handy during video-conferencing. 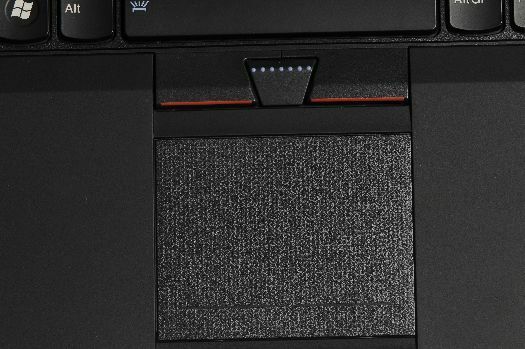 The Lenovo X1’s fingerprint sensor sits below the keyboard on the right side of the palmrest. It is useful for biometric features like logging into system, website, dedicated software consoles, etc. The business ultraportable’s label itself is hidden away on the internal spine/hinge of the X1. Further evidence that nothing on the ThinkPad X1 is loud and overstated. A close-up view of the ThinkPad X1’s metal hinges. 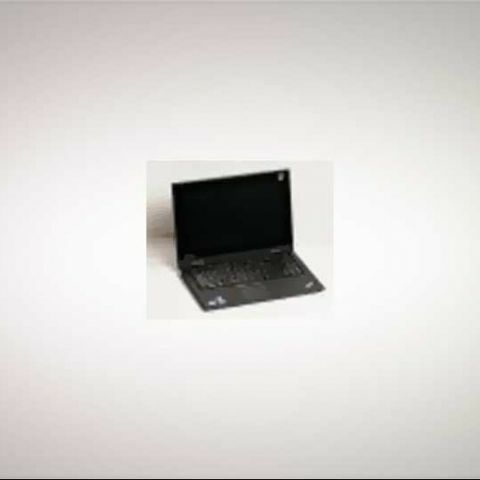 It brings together the chassis of the laptop and helps keep it strong and sturdy, which it is. Lenovo claims that the X1 has a U.S. mil spec rating of 8 -- lesser than the Toughbooks but better than most consumer and business laptops. The laptop can survive drops up to 3-4 feet with no internal damage -- Lenovo demonstrated this at the X1 launch. As most ThinkPads, the spine of the laptop houses most of the connectivity ports, and it’s the same on the Lenovo X1. You can find a USB 3.0, HDMI, mini Display Port, hybrid eSATA and powered USB, and a power adapter inlet. There’s an ethernet jack and SIM card slot, too, along the spine -- something our picky photographer missed. This ensures all the connecting wires to come and accumulate at the back of the laptop, nothing left or right. The Lenovo ThinkPad X1 comes with the 2nd generation of Intel Core i5, i7 Sandy Bridge processors, up to 8GB of DDR3 RAM, SSD and 7200rpm HDDs, onboard Intel HD 3000 or dedicated Nvidia GeForce 500M series graphics. With the X1, Lenovo is aiming to up the ante on past X-series ultraportables by making it more multimedia friendly -- hence the inclusion of a glossy widescreen display, HDMI port, and Dolby Home Theater speakers. Lenovo ThinkPad X1 launched in India, it is the slimmest Lenovo Thinkpad ever!